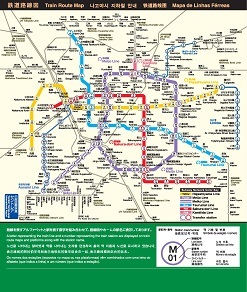 Nagoya has subway, bus, JR train, Meitetsu train and Kintetsu train networks for public transportation. Those attending the MICCAI conference will find the subway line quite convenient for access to Nagoya University Higashiyama Campus (conference venue), Nagoya Central Railway Station (Nagoya Eki) and downtown areas (Sakae, Mei-Eki, Kanayama and Osu). To access the MICCAI conference venue (Nagoya University Higashiyama Campus), the Meijyo line is convenient. Nagoya Daigaku (名古屋大学) (Nagoya University) station is the nearest station (on Nagoya University Campus). Toyoda Auditorium can be accessed from Exit #2 of Nagoya Daigaku station. The Meijyo line is a circular line, like the Circle Line of the London underground service. Train direction is announced as "clockwise" or "counter clockwise." Please note that some train services terminate at certain stations. The Sakae area can be accessed via the Meijyo line. If you would like to reach there a bit faster, use a short-cut: take the Meijyo-line at Nagoya Daigaku Station in counter clockwise direction, transfer to Higashiyama line at Motoyama station for Takabata and get off at Sakae station. Nagoya station is also two stops from Sakae station. Subways run every several minutes from about 05:30 until about 00:30. Subway system map is available here. If you search a timetable from Narita to Nagota, please input Shinagawa as "via" station (Click "SearchDetails" and input Shinagawa in Pass1). Subway Fares range from 200 to 320 JPY. Buy a ticket of the correct price at a ticket vending machine. Ticket prices are presented on the subway map shown above the vending machine. One-day passes can be purchased for 600 JPY (bus only), 740 JPY (subway only), and 850 JPY (both bus and subway) Please note that ticket vending machines do not accept credit cards. The Manaca card is very convenient for traveling inside Nagoya. This pre-paid public transportation ticket is a non-contact IC card (like the Oyster card of London, UK). The Manaca card can be purchased at ticket vending machines located in all subway stations will 500 JPY deposit. The vending machine will ask your name, for printing on the IC card. Please touch your Manaca card at the ticket gate when entering and exiting a platform. The system will automatically deduct travel cost from your card. If you will be using the Nagoya subway multiple times in a day, we advise you to purchase a one-day ticket. The Manaca card can be used in many cities throughout Japan, including Sapporo, Sendai, Niigata, Tokyo, Kyoto, Osaka, and Fukuoka areas. Similarly, IC cards issued in these areas can be used in the Nagoya area. For example, if you have a Suica card issued in Tokyo, it can be used in Nagoya. It can also be used as electronic money at many convenience stores. Note that the Japan Rail Pass cannot be used for Nagoya subway and bus. The taxi is an alternative option for getting around within Nagoya. The minimum taxi charge is only 480 JPY. Most taxis can accept major credit cards (Visa or Master preferred).